The intent of this category is for you to demonstrate "the prototypical rendering of scenic effects from the ground up." The type of scenery that you choose to model is entirely up to you. An urban landscape involves just as much scenery (if not more) as a mountain or desert landscape. 1. 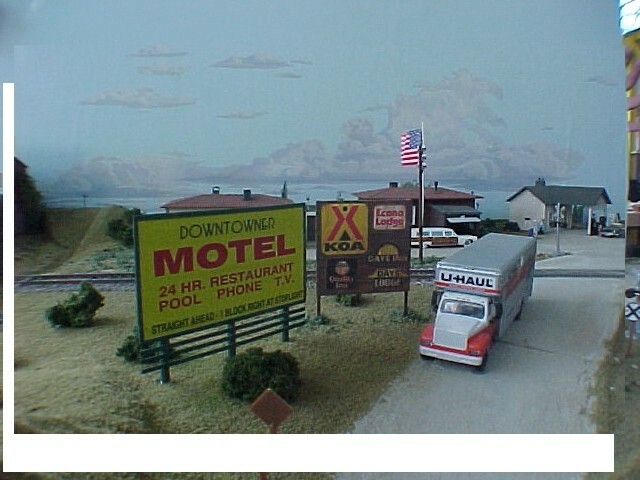 Construct a completed section of a model railroad of at least sixty square feet in O scale, or forty-five square feet in S scale, or thirty-two square feet in HO scale, or eighteen square feet in N scale or other scales in proportional relationship to HO scale. 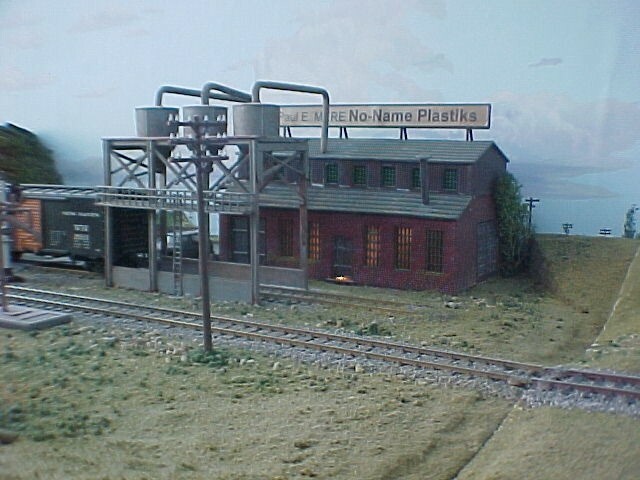 This completed section must contain the necessary scenic elements of Terrain, Structures, Background, Lighting, and Realism/Conformity as combined to achieve a realistic effect using applicable NMRA standards. in that particular model railroad scene. The intent of this category is the prototypical rendering of the scenic elements from the ground up. The ground and all natural features such as rocks, water, trees, hills and depressions, as well as man made features such as railroad roadbed, cuts, fills, drainage ditches, embankments, streets and roads, etc. Structures are considered from the standpoint of prototypical suitability, placement, and appearance as scenic effects - NOT as to construction (which is covered under Master Builder - Structures). This includes bridges, trestles, and culverts, buildings and all other types of structures (towers, power lines, signs, fences, retaining walls, etc. 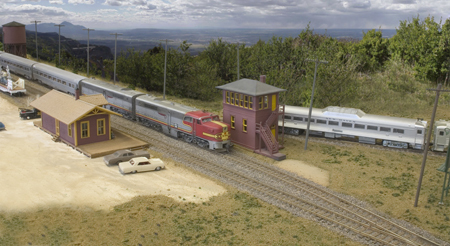 ), track and right-of-way features such as turnout controls, signaling structures, crossing gates and shanties, turntables and other service structures, etc. 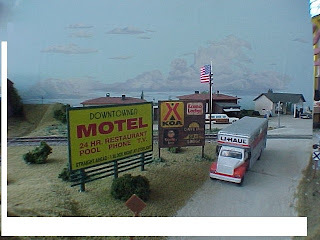 Treatment of the wall, backdrop, and/or ceiling to realistically depict depth, distance, horizon, and sky. 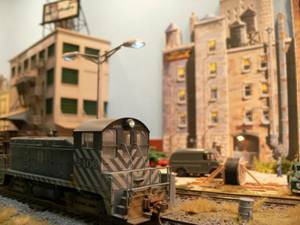 a) railroad cars, signals, etc. b) buildings, streets, and roads, etc. c) overall lighting effects - day and/or night. 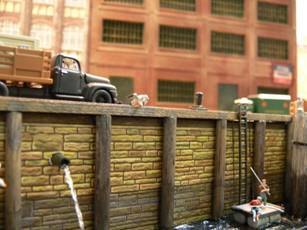 An entirely daylight scene is acceptable. This lighting information must be included in the material prepared for Section 4 below. In the other four judging areas, the judges evaluate what you were trying to do - what you remembered to include in your scene. In this one, they evaluate how well you did what you were trying to do. Your entire layout does not have to be completed to be judged - just enough to meet the minimum space requirements given above. However, the areas which are not to be judged should be blocked off (visually) from those that are. 2. 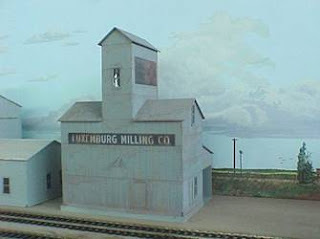 Prepare a set of photographs (video tape presentation is acceptable) and a written description clearly describing the intended setting of the model railroad and the scenic details including towns or cities in the area being judged. 3. Prepare a description of the materials and methods of construction used in creating various features of Terrain, Background, and Lighting. 4. 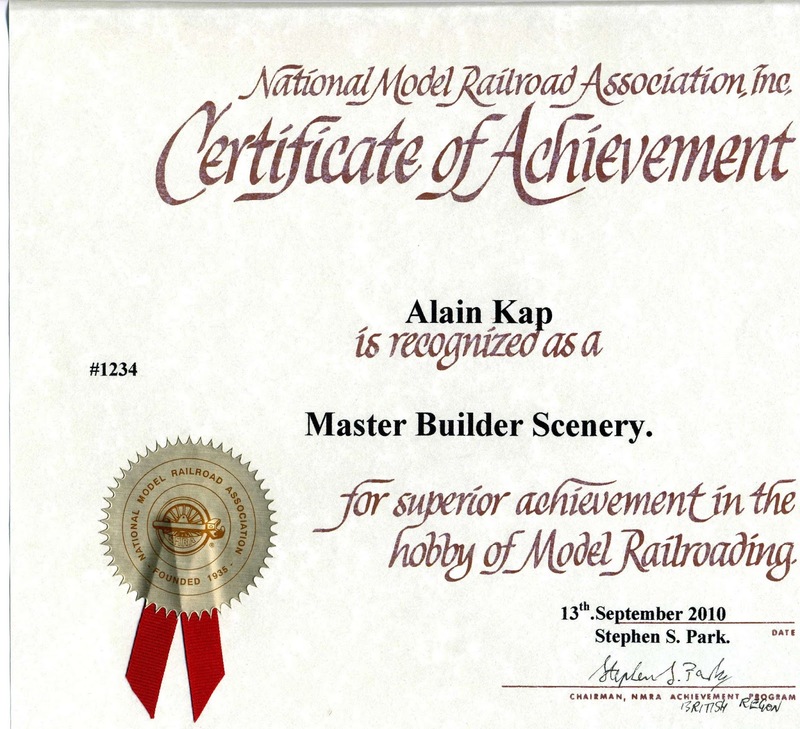 Attach one copy of materials in Sections 2 & 3 to the Statement of Qualification (SOQ) for use by the judges in determining the effectiveness of the craftsmanship displayed by the member requesting certification. 5. Earn a Merit Award of at least 87.5 points on the section of layout being judged. 6. Submit a completed Statement of Qualifications (SOQ) including the attachments for Sections 2 & 3 and the signed merit judging forms and/or copies of the Merit Award certificates from Section 5. 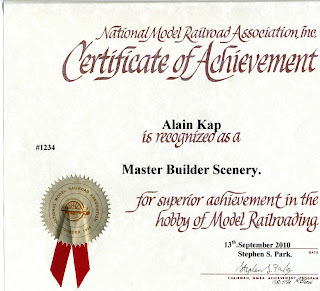 Unfortunately I had no permanent home layout when I assembled the material for this certificate. 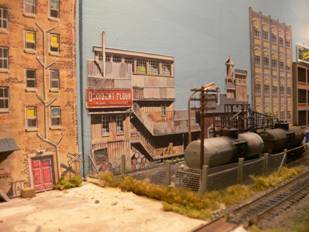 Instead I had built a number of Fremo Modules and exhibition layouts of various sizes over the years. 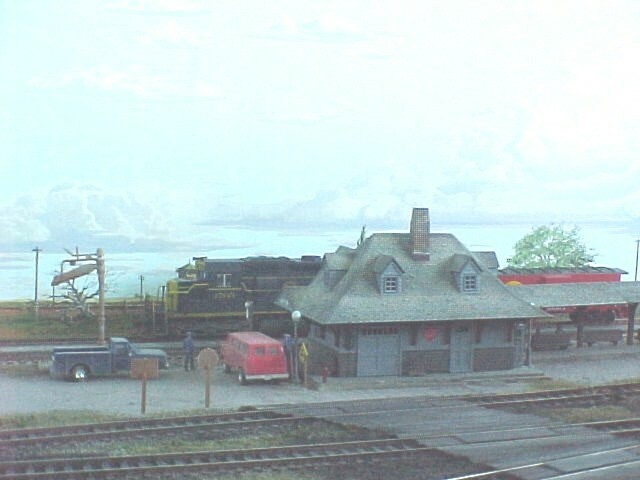 and layouts to fulfill the requirements. 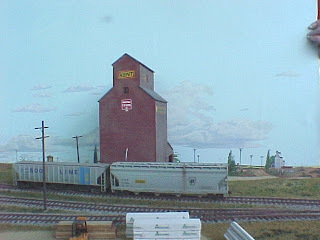 Railroader Magazine called "One of my towns is a timesaver". 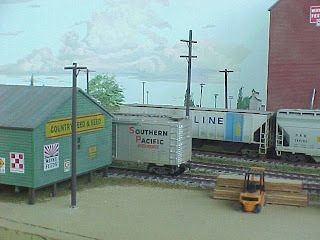 features on one layout. I'm glad I could piece it together like this but its certainly not the best way to do.